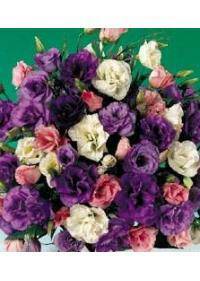 Lisianthus is a half hardy perennial, meaning they are adaptable. They are not delicate like many tender plants but they are not hardy. For this reason care must be taken when adding them to a garden. These delicate flowers are often added to containers for color. There are many hybrids available, allowing for better color options. In the wild they are often found in grassland areas that get rain. Various assortments of Lisanthus can be bought and delivered to cities in and around Santa Rosa, CA, Centennial, CO, Pompano Beach, FL, Portsmouth, VA, and Denver, CO. Through florists, they are normally sold as cut stems rather than plants. Eustoma exaltatum is often called Catchfly or Bluebell gentian. The name comes from the open "mouth" of the flowers, which is wide. These often grow in clusters when in optimal conditions of soil. These are found in coastal areas as well as in some prairie areas. South western areas of North America are often home to this species. Flowers are often a pale purple and may be several inches across. Eustoma grandiflorum is a commonly cultivated species for gardens. White is a commonly found color, as are light and dark blue shades. Foliage is often a blue-green color and looks striking in a garden. They flower in summer and may need to be started in winter to bloom. Because of this many gardeners prefer to start them indoors in winter. This is often done for those who grow them in pots for a garden.
. Some hybrids have a more larger and more open face for the flowers. Others have been bred to produce blooms that are more rose like. This can increase the showy displays available for floral gardens. Containers are one of the top uses for this large blooming flower. They can be grown in hanging baskets, window boxes or containers. This allows for color in almost any location around homes or gardens. Containers also make it easy to prevent over watering of plants. Holes in the bottoms are necessary to allow excess water to drain. Pebbles near the bottom of pots may also help to prevent flooding. For gardens, well drained soil must be created for plant survival. A sloped surface may also be used if the area is prone to floods. This will give the flowers ample soil to grow in that dries out. Fertilizers can be used when preparing soil for gardens or a pot. A basic flower food can be used to provide ample nutrients for blooms. Some hybrids may needs more fertilizer than others do for flowers. Sunny locations are best, with at least four hours of direct sun. If direct sun is not available, indirect light should be given. Full shade should be avoided whenever possible for gardens or pots. Double flowers can often be used with the same meanings as roses. Some hybrids may also appear like peonies and can mean the same. This makes them a versatile flower for arrangements and bouquets. Both single and double flowers often are used to show appreciation. Ruffled species may represent appreciation of ones beauty or grace. This makes the lisianthus a popular choice for cut stem arrangements.